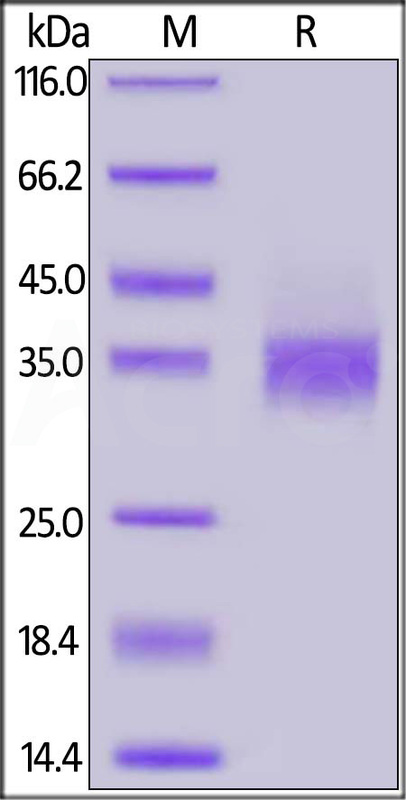 MABSol® Biotinylated Human EpCAM / TROP1 (EPM-H8223) is expressed from human HEK293 cells. It contains AA Gln 24 - Lys 265 (Accession # AAH14785.1). It is the biotinylated form of Human EpCAM / TROP1 Protein (Cat # EPM-H5223). This protein carries a polyhistidine tag at the C-terminus. The protein has a calculated MW of 29 kDa. The protein migrates as 33-36 kDa on a SDS-PAGE gel under reducing (R) condition due to glycosylation. The biotin to protein ratio is 6-7 as determined by the HABA assay. Biotinylated Human EpCAM, His Tag on SDS-PAGE under reducing (R) condition. The gel was stained overnight with Coomassie Blue. The purity of the protein is greater than 95%. Authors: Benjamin H, et al. Authors: Grzeschik J, et al. EpCAM is also known as CO171A, EGP, EGP40,GA7332, KSA, M4S, MIC18, MK1, TROP1, hEGP2, and is a pan-epithelial differentiation antigen that is expressed on almost all carcinomas as 17-1A(mAb) antigen. Its constitutional function is being elucidated. It is intricately linked with the Cadherin-Catenin pathway and hence the fundamental WNT pathway responsible for intracellular signaling and polarity. The epithelial cell adhesion molecule (Ep-CAM) is known to express in most epithelial malignancies and was reported as a tumor marker or a candidate of molecular targeting therapy. Ep-CAM cross signaling with N-cadherin involves Pi3K, resulting in the abrogation of the cadherin adhesion complexes in epithelial cells was reported. And Epithelial cell adhesion molecule (Ep-CAM) recently received increased attention as a prognostic factor in breast cancer. (2) Akita H, et al., 2011, Oncogene., 30 (31): 3468-76. (4) Schmidt M, et al., 2011, Breast Cancer Res Treat. 125(3):637-46.